Outdoor Gallery in the Bear Pit. 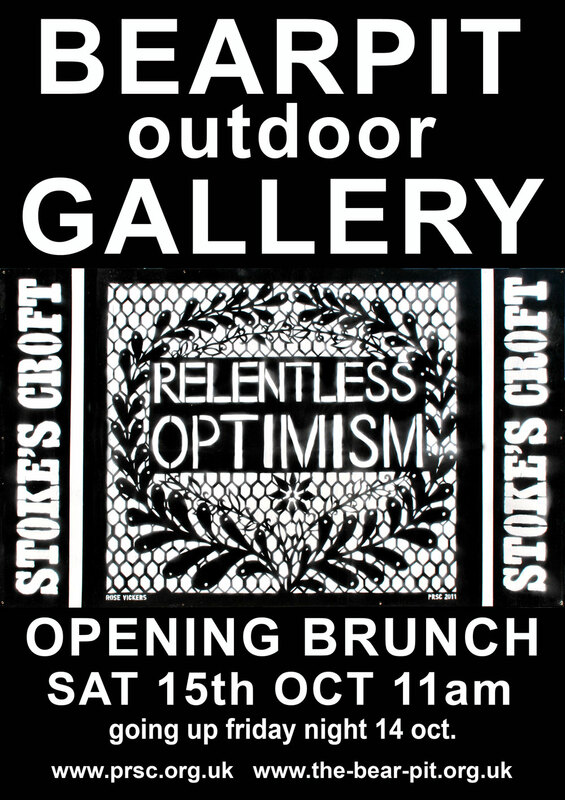 Opening Sat 15th Oct. Coffee and Buns at 11 am onwards. The Bear Pit (St. James Barton Roundabout) will become an Outdoor Gallery as the work of 20 of Bristol’s finest adorn the four tunnels that lead into the Bear Pit. Artists include: Johnny 5, Jon Taphouse (Photographer), 3-Dom, Sepr, Katy Bauer, Jedna Hall and Dones, to name but a few. Organised by PRSC, the tunnels become a gallery and a resource, in line with the thinking behind The Bear Pit improvement Group http://www.the-bear-pit.org.uk, and indeed PRSC. Gentle incremental change in our public spaces, curated by and involving local people is a welcome change from the corporate dominance that increasingly governs the nature of our City.